Most pregnancies result in the birth of a normal healthy baby. But if the mother had a health problem before pregnancy or if she develops a problem during pregnancy, then there is an increased risk to the health of both the baby and the mother. Also there are other risk factors like the life-style the mother leads, that could importantly affect the health of the baby. Poses risk of early miscarriage, small babies and still birth. Preferably even ask your partner to stop smoking, as passive smoking is as harmful as active smoking. 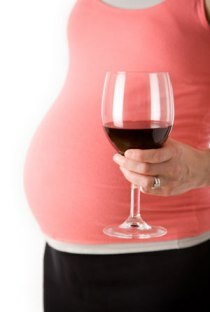 Research shows that drinking alcohol even in moderate amounts increases the risk of miscarriage or low birth weight of babies. Many drugs cross the placenta and cause severe abnormalities. Before taking any pills, antibiotics or drugs for any illness, it is important to consult your obstretician. Note : Even aspirin, sleeping pills and anti diarrhoeal tablets can cause problems. Certain tetrogenic substances (agents that cause birth defects) can be found in the work place e.g. lead or mercury or ionizing radiations used in X-rays. These interfere with the normal development of the baby, especially if exposed in the 1st trimester, when the baby’s organs are forming. Problems can arise at anytime and because they threaten both the health of the mother and the baby, the risks should be assessed throughout pregnancy with intensive prenatal care. Any infectious disease: Especially contracting German measles (rubella) in the first trimester can cause birth defects, miscarriage or still birth. Hypertension: Pregnancy induced hypertension (PIH) can lead to eclampsia (a complication of pregnancy in the 3rd trimester), with dire results to the mother and baby. Diabetes: This can result in large babies with difficult delivery or still birth. Severe Anemia: Some degree of physiological anaemia occurs in most pregnancies, but pathological anemia should be actively treated as it affects the growth of the baby and also leaves the mother feeling debilitated. RH factor: If the mother is RH negative and father is RH positive it has effect on the fetus. In Mothers less than 15 years or older than 35 years. In twins and triplets where special antenatal care is necessary. Any problems in previous pregnancies like bleeding in the second or third trimester or pregnancy induced hypertension or previous caesarian section can recur again. Any previous birth defects or abnormal heart beats. Toxoplasmosis, is a disease which affects the health of the baby in the womb. This parasite which is in the cats litter contaminates the soil and you can get the disease by handling this contaminated soil e.g. in gardening. Also flies and cockroaches spread contaminated soil or food.